Wonder Woman zipper pouch. Diana Prince. DC bombshell. Wonderwoman change purse. Super hero coin wallet. Tuck your treasures inside this little square pouch which measures approximately 5 inches by 5 inches square. Just the right size to stash a few small goodies into your purse. 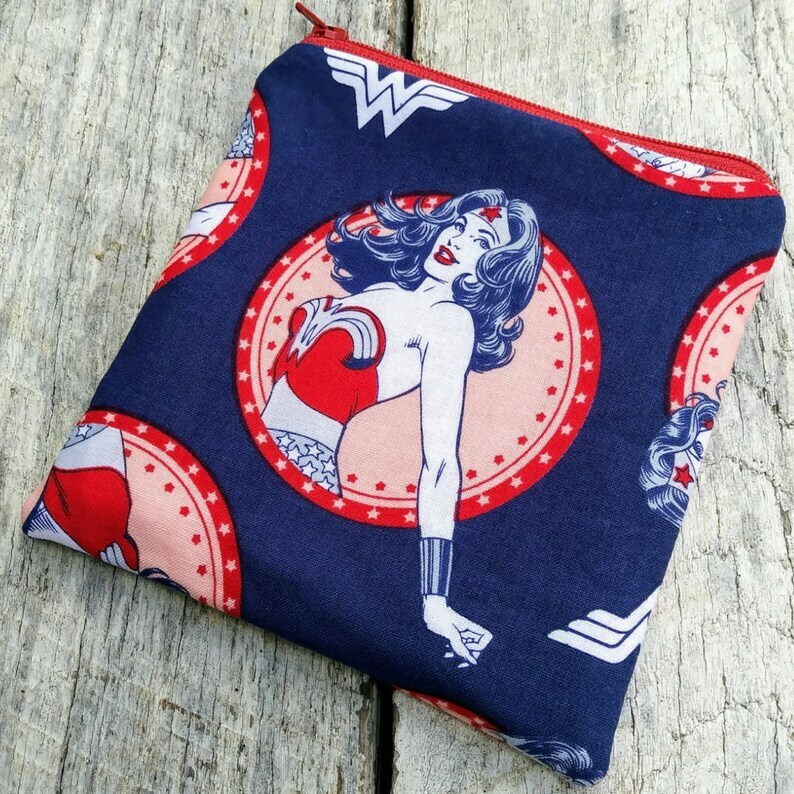 The pouch body is made of a blue cotton fabric featuring Wonder Woman. The pouch is fully lined with a red and white polka dot cotton fabric. A layer of flannel between the cotton fabrics gives the pouch extra body and a nice squishiness. Pouches can easily tuck into any other order and will ship for no additional cost if purchased with another item. Origami dogs mini zipper pouch. Little change purse. Puppies coin wallet. Star Wars zipper pouch. Princess Leia and Han Solo. I love you, I know. Carrie Fisher change purse. Jedi recommended. Yellow floral small zipper pouch. Coin purse. Patchwork owls zipper pouch. Small change purse. Blue owls and red polka dots notions bag. Lipstick faces pouch. Square zipper pouch. Makeup bag. Ladies change purses. Black and white. Red lips. Aqua lace on ivory square zipper pouch. Mini patchwork change purse. Appliqué felt heart details. Small zipper pouch. Quilted pink floral fabric bag. Beauty and the Beast zipper pouches. Yellow and white gift set. Embroidered square pouches.